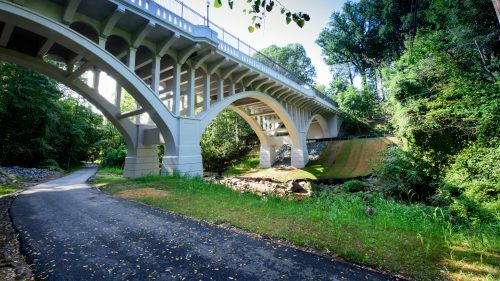 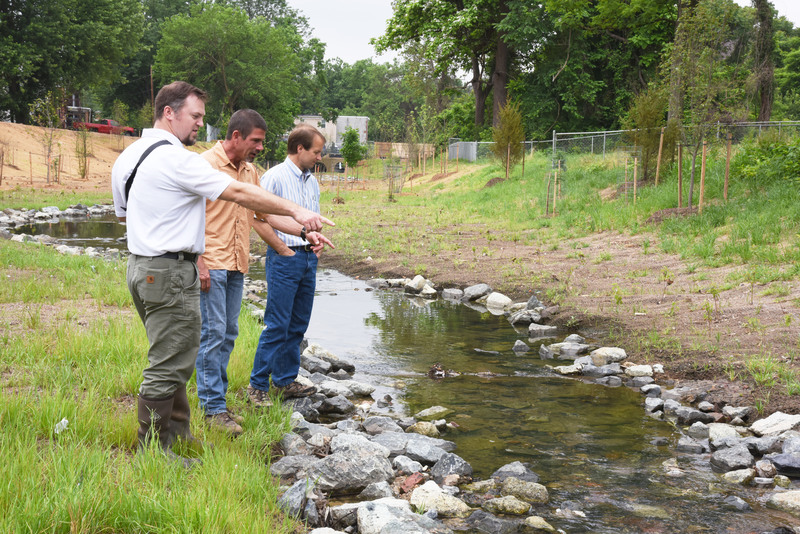 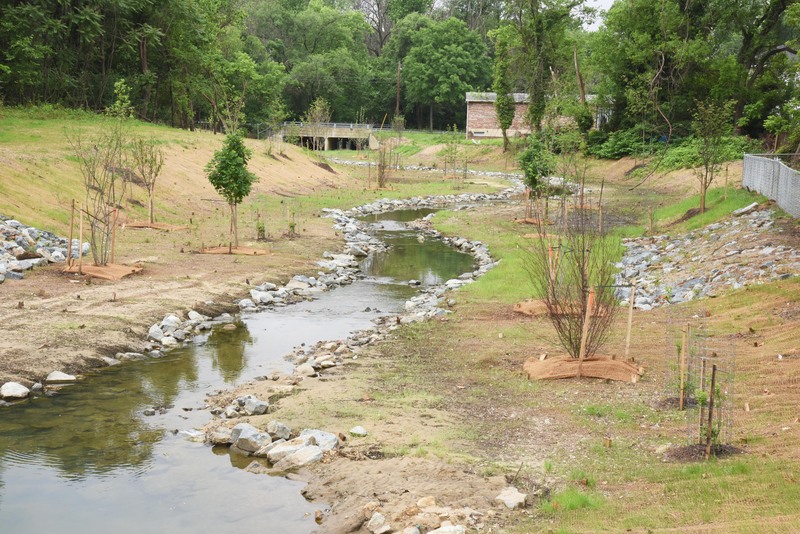 JMT designed the restoration of a main tributary in the nation's capital. 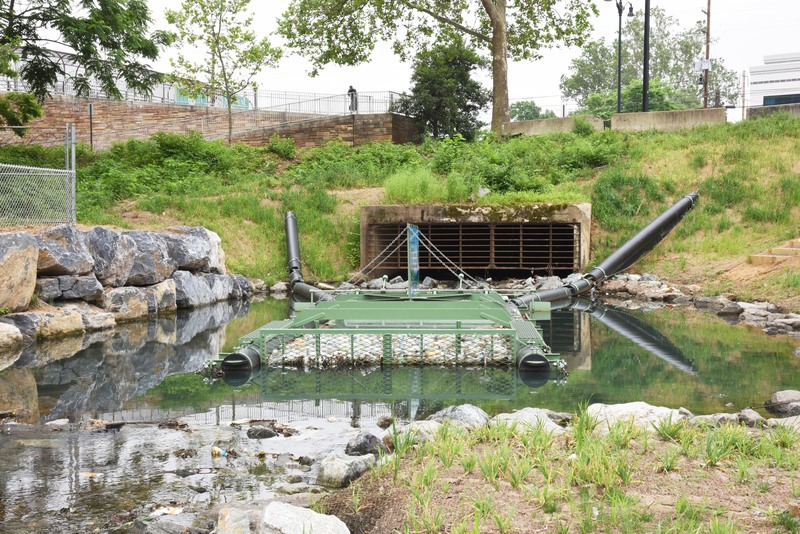 Nash Run, an ultra-urbanized tributary in Washington, DC, had 49 percent of its watershed covered by impervious area and contributed three percent of its total floatable trash load to the Anacostia River. The Watershed Protection Division of the District Department of Energy and Environment (DOEE), in cooperation with the Stormwater Management Division of DOEE, selected JMT to design a 1,400 LF stream restoration project within the District’s limits. 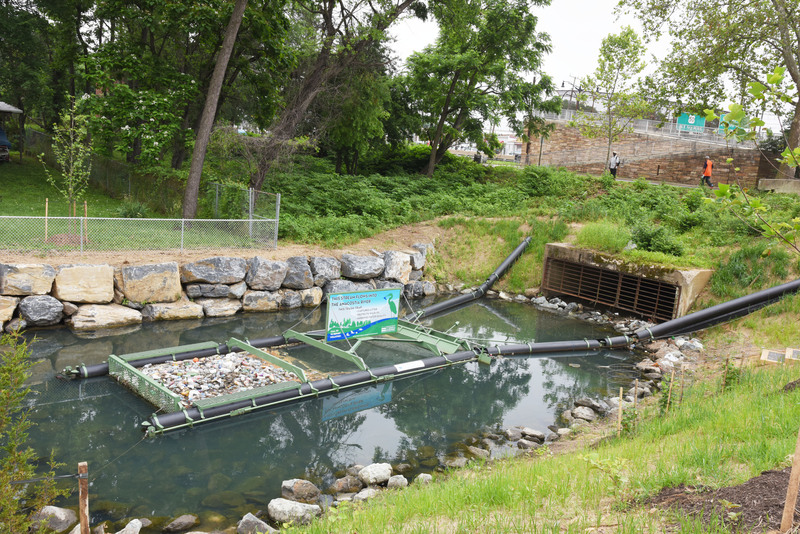 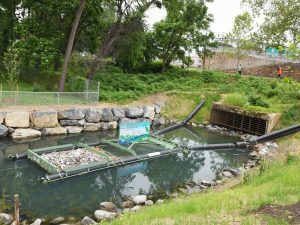 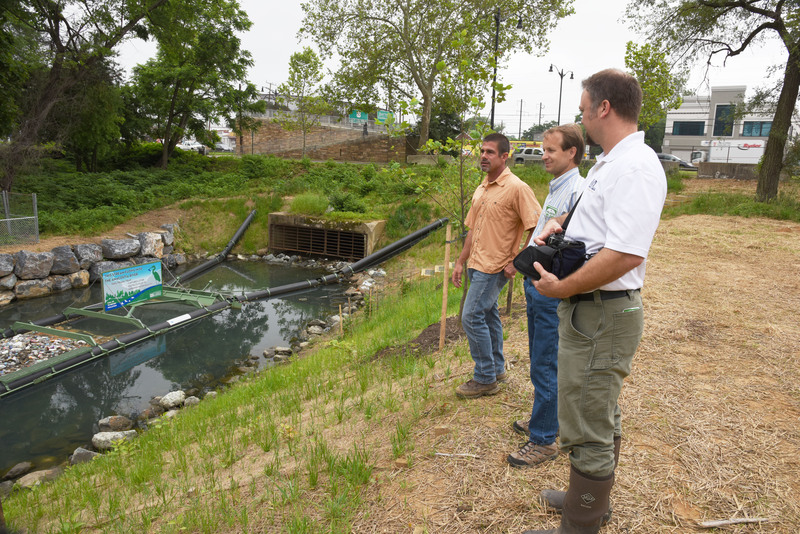 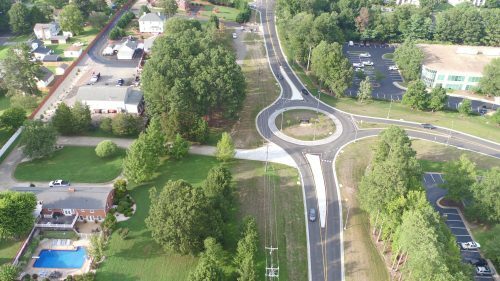 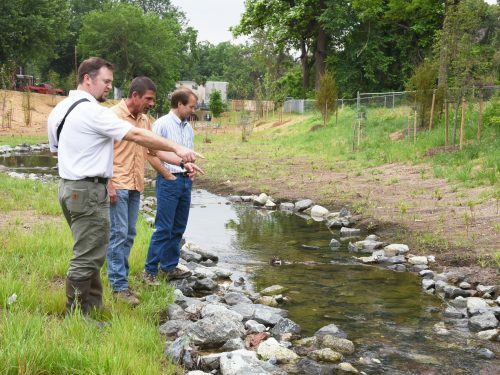 DOEE sought an integrated design that maximized removal of trash and sediment from stormwater, provided the stable conveyance of flood flows, and increased water quality and the ecological functions of Nash Run. JMT developed complete design documents to restore a highly degraded section of this first order tributary to the Anacostia Riverr to provide water quality improvements and meet Total Maximum Daily Load (TMDL) and MS4 permit requirements for the Anacostia River. The project included a trash Best Management Practices (BMP) collection system capable of removing 100 percent of all floatable trash prior to entering the restoration. We developed designs and bid-ready construction specifications for the trash and sediment BMP and stream restoration. 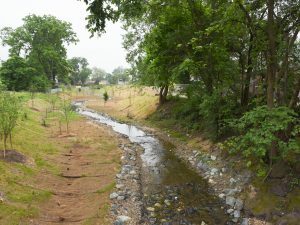 Another major design consideration was reducing the extent of the 100-year flood boundary to remove several properties within the flood zone. Our design focused on maximizing floodplain area to provide reconnection, increased attenuation, riparian wetland creation, and aquatic and riparian habitat enhancements. 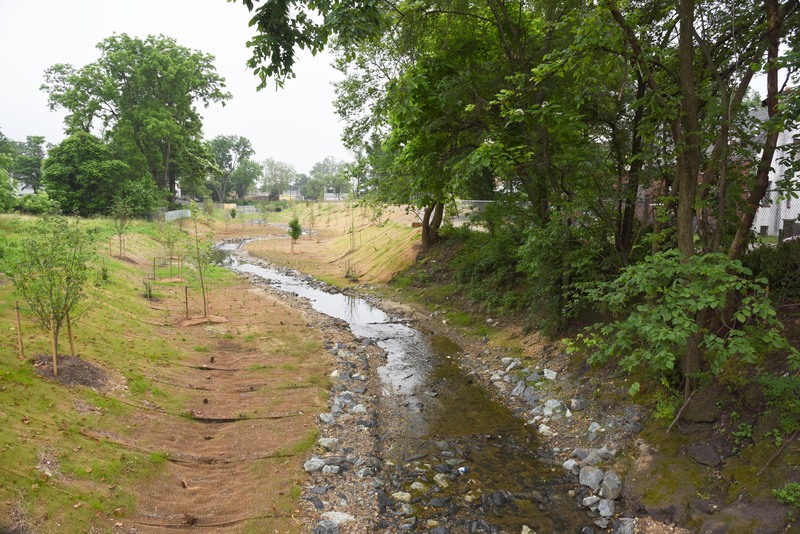 Though the necessary floodplain area could not be achieved due to adjacent property impacts, we proposed an imported surrogate streambed substrate to be installed under the belt width of the new channel that would offset the tractive forces to the 100-year storm event. 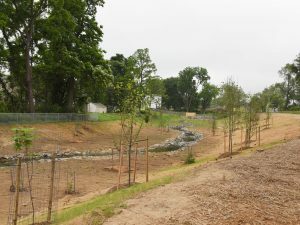 The innovative design of the floodplain surface included hiding the surrogate stone under a minimum of six inches of soil to allow for a growing medium, and repurposing logs cut from trees removed from the site to create subsurface water blockages in the floodplain for wetland hydrology, grade control of the channel, in-stream and floodplain habitat features, and sequester carbon into the system. 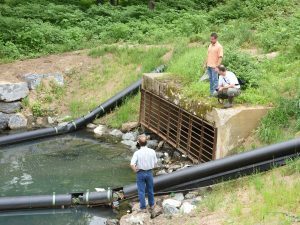 To provide energy dissipation of the urbanized flows entering the project site, JMT designed a permanent scour hole and imbricated rock wall to protect adjacent properties. 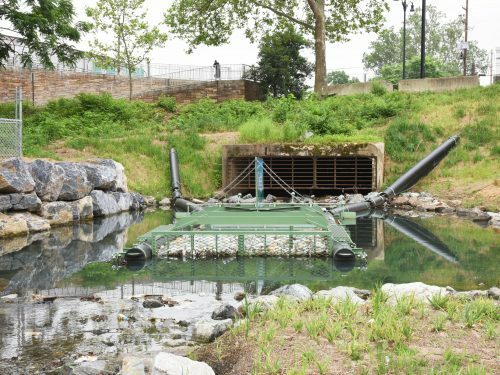 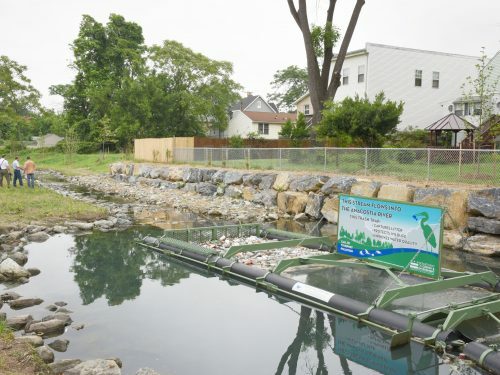 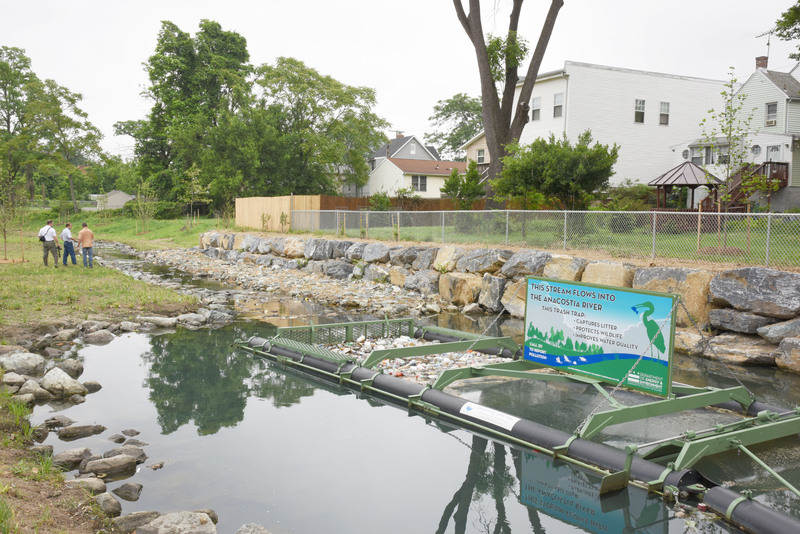 JMT designers worked closely with Storm Water Systems, Inc. to develop the custom fit trash collection system that would remain permanently in the scour hole to capture floatable trash and polluted organic street matter. Additional scope included the hydraulic analysis and replacement of existing culverts in the central portion of the reach, which, along with the additional storage created through the floodplain restoration, removed local residences from the 100-year floodplain. 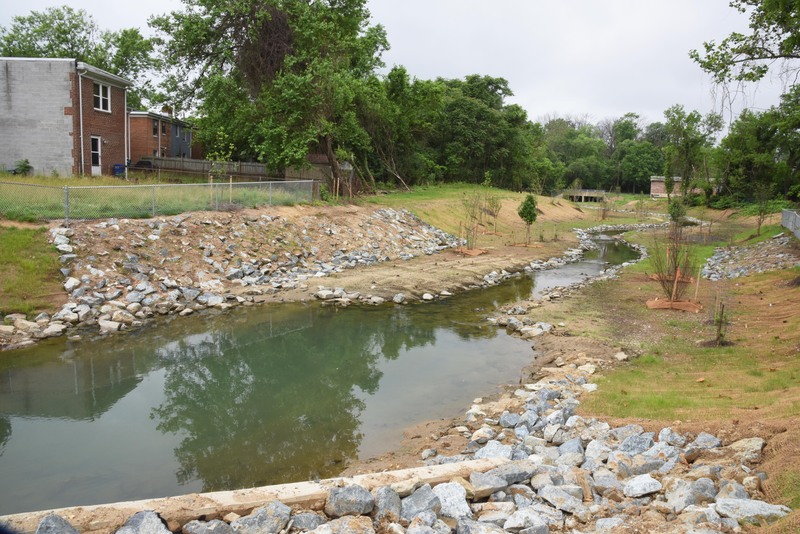 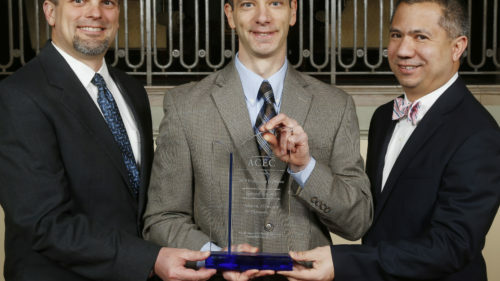 Services for this project included a geomorphic watershed and sediment mobility analysis, streambank and soil analysis, flow gage installation and analysis, hydrologic and hydraulic analysis, erosion and sediment control design, archaeological investigations, and environmental permitting. 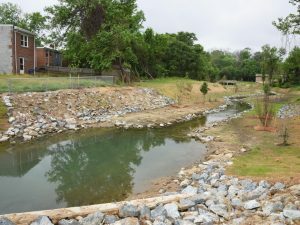 As the result of multiple properties near the project site being affected, community outreach and coordination was an essential component to the project’s success. 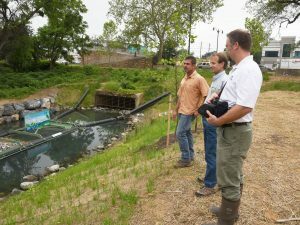 The project team attended public meetings to address any questions from community members regarding environmental concerns. The project creates 1.08 acres of wetlands in an urbanized area of the District where none previously existed. 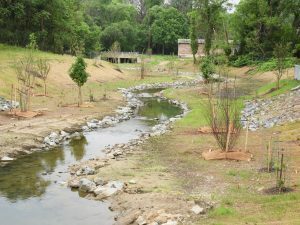 Additionally, strategically placed salvaged wood and rock from the site, reconnection of the floodplain to groundwater, and a robust, native landscape plan have contributed to an increase of ecological functionality.